Kim is a business banking relationship manager based out of Charleston, WV. 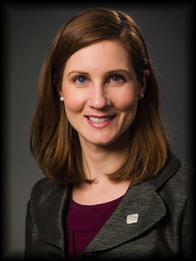 She has been with Fifth Third Bank as a relationship manager for five years and in banking for nine years. She enjoys helping business clients meet their goals and needs throughout the state of WV, Southern OH, and Eastern KY. She takes the time to fully understand business owners objectives then leverages her knowledge and resources to deliver customized financial solutions. She is committed to positioning her clients for success now and into the future. Kim graduated from Ohio State University in 2006 with her bachelor’s degree. Kim is happily married and has two horses, a thoroughbred and pony. In her spare time, she enjoys home renovation projects and jumping her horse. Kim is also very active in her community volunteering for the United Way of Central of WV as a community services member and a team chair for the Citizens Review/Grant Allocation. She is also a member of the Charleston Rotary Club and is currently serving as president for the Charleston Lion’s Club. She volunteered with Generation Charleston, the community Young Professional Group and served as the co-chair of Generation Charleston in 2014 & 2015. Kim was recently nominated for the 2017 Emerging Leaders Program with the West Virginia’s Bankers Association.